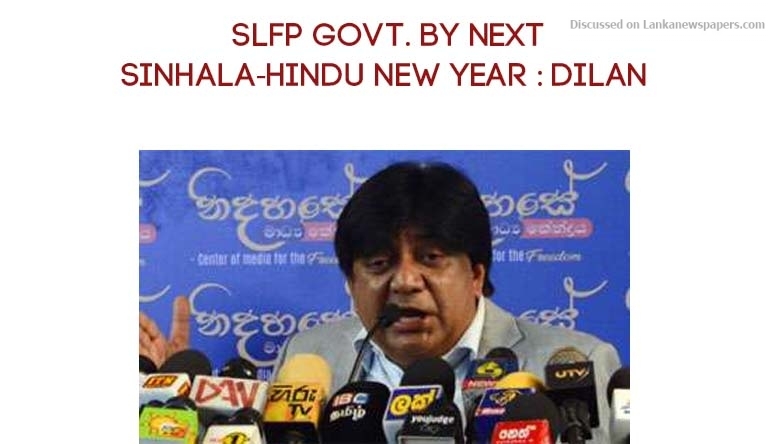 Badulla District Parliamentarians, Dilan Perera said today that the 15 SLFP group of rebels are determined to form an SLFP government with other progressive forces by hook or by crook by the next Sinhala and Hindu New Year and put Prime Minister Ranil Wickremesinghe in his rightful place. Mr. Perera also expressed his doubts on the conjecture floated by a group of Mahinda Rajapaksa supporters that the ex President could become the Executive President for a third time but added it would be great (Mal Hathai) if possible. “I have a problem in this claim that former President Rajapaksa could contest the next Presidential election and become President for a third time. If he could do it he is the best politician to be the next President and there is no doubt about it,” he stressed. Responding to a journalist at yesterday’s weekly news briefing of the SLFP rebel group in Colombo as to what would be the position of incumbent President Maithripala Sirisena in case Mahinda wins the Presidential poll, Mr. Perera said the next Executive President who will be elected under the provisions of the 19th Amendment to the Constitution will be a weak and powerless President. “Under the 19th Amendment, the Prime Minister is more powerful than the President. Therefore, Mahinda can become the all powerful Prime Minister under a weak Sirisena as the President,” he said. Mr. Perera who is also a lawyer said Nihal Jayawickrama, Prof. G.L Peiris and many others have floated this idea of Mahinda contesting the forthcoming Presidential poll and becoming Executive President for a third time as they like to think in that way but the reality was far away and the 19th Amendment was very clear about it. He denied the remarks that had been made by Transport and Civil Aviation Minister Nimal Siripala De Silva that President Sirisena or the SLFP Central Committee ever consented to the suggestion that the SLFP Ministers must quit the ‘Yahapalana Government’. ‘I wonder whether Minister De Silva whom I respect much and my district leader was suffering from dementia when he said this. Former Minister Anura Priyadharshana Yapa made the request in writing and Minister De Silva himself made a request to Prime Minister Wickremesinghe with the knowledge of party leader, President Sirisena to resign from the post of Prime Minister. I addition the proposal that the SLFP must quit the government was sumitted to the party’s Central Committee but never discussed it or approved as General Secretary was Minister Duminda Dissanayaka. Minister De Silva further said at a later stage that SLFP Ministers in the government work in cahoots with those SLFP members who had quit the government to topple the UNP led government and form SLFP government. When the time comes both groups would joint to do the job,” he added. Mr. Perera said he expected that Mr. Perera would refrain from making what he called ‘mongol remarks’ hereafter.